My mom was happy to see the Pope when he came to Philadelphia. Joanne Lynch died Thursday, April 27th, 2017, at her home in Wildwood Crest, NJ. Born to William and Joan Shefski on July 17th, 1957, in Philadelphia, PA, Joanne is survived by her mother, her husband Walter, her brothers William, Daniel, and Patrick, her sisters Barbara Anne, Dianne, Suzanne, and Peggy Anne, her children Katherine, Matthew, Megan, and Sean, her grandchildren Rosie, Olivia, and Ronan, as well as numerous other family members. Joanne has been battling Ovarian cancer since she was diagnosed in February of 2016. She celebrated her 40th wedding anniversary with her husband and family in October of 2016. 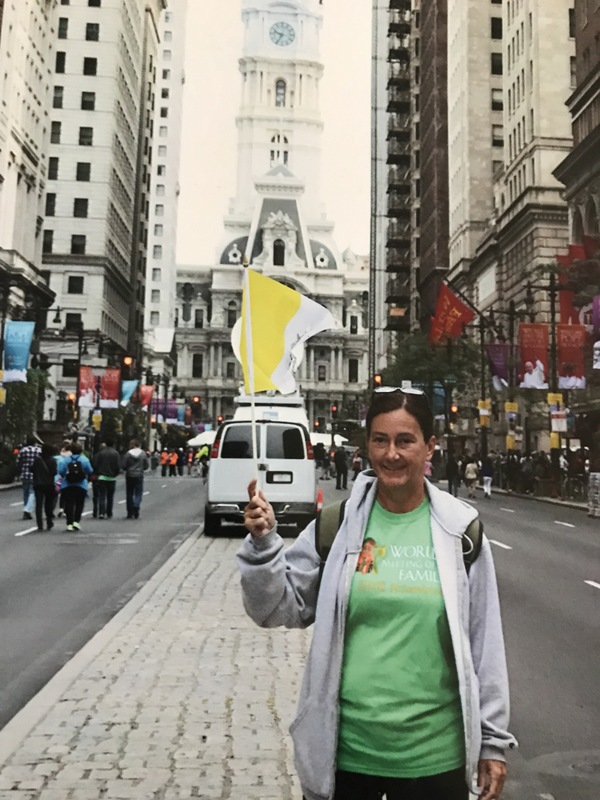 Joanne was a dedicated member of her parish, Notre Dame de la Mer, in Wildwood, NJ, and found joy in teaching CCD classes and committing herself to other charitable work. A hard worker until her sudden diagnosis with stage four cancer, Joanne’s last job was as a server at Aleathea’s Restaurant in Cape May, NJ. Above all, Joanne was a devoted mother who sacrificed her time and energy to help provide for her family through phases of financial and emotional hardships. Joanne passionately cared for her family, and was never afraid of making her opinion known, especially with her husband. Inheriting her mother Joan’s strong will, Joanne had the ability to seem contentious even if she agreed with you on the subject at hand. Joanne’s love for baseball and football stemmed from her late father, William Shefski, who was a sports writer for the Philadelphia Daily News. Joanne graduated from Haddon Township High School in 1975. Her favorite classes were Russian and English. Even though Joanne did not attend college, she was intelligent and very knowledgeable on a vast range of subjects, especially religion, politics, literature, art, fashion, and design. Joanne was immensely proud of her Irish heritage, and delighted in learning about Irish culture, loved reading Irish literature, listening to Irish music, and watching Irish dancing. Joanne worked countless jobs, including as a server, shoe salesperson, and furniture salesperson, however, she especially loved working at Aleathea’s Restaurant because of her co-workers and the environment. Aleathea’s is a beautiful Victorian Inn right by the Atlantic Ocean in Cape May, and since Joanne’s favorite past time was sunbathing on the beach, it was the perfect place to work for her. Joanne’s other favorite activities included reading, watching sports, and praying. Joanne was a fantastic salesperson and server, but her best role was as a homemaker. One could often find Joanne singing Feist, Sting, or U2 while cleaning the kitchen. As a mother, Joanne invested all of her hopes and dreams into her children. Her strong Catholic faith was her guidance. A private viewing will be held for close friends and family at Assumption Church Monday at 9am. The funeral service will be held at Assumption Church in Wildwood Crest on Monday at 10am. After the funeral, attendees are invited to gather at Aleathea’s Restaurant in Cape May. Interment will be at St. Mary’s Cemetery. In lieu of flowers, please send donations to the Love of Linda Cancer Fund, PO Box 1053, Wildwood, NJ, 08260. 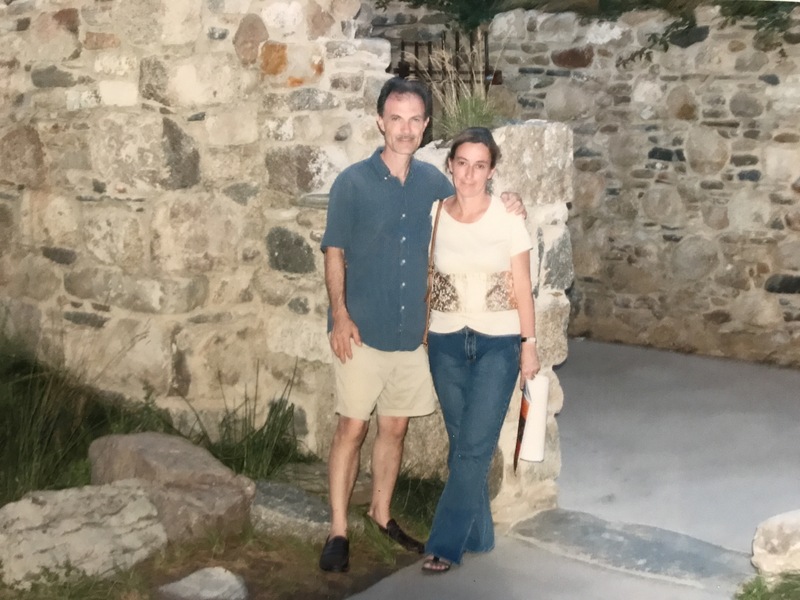 My mother and father at the Irish Famine Memorial at Battery Park in NYC. So sad to hear of my dear niece Joanne’s death. She was always in my mind even tho far away. May she rest in peace. My prayers are with my whole family. So sorry to read of your family’s loss. Losing a parent is always tough, and especially when she is as wonderful and warm and fierce a person as your mother apparently was. She’s my age, and attended school near me–I wish I’d known her. You are lucky you knew her, too. I wish you had all had more time together. Much peace to you and yours during this sad time. Beautiful in every way. A great friend, one of many in our tribe that shared of love music and road trips to New York and to wherever. I was proud to be best man at Walt and Joanne’s wedding back in the day. I always looked forward to seeing her and the Shefski family any chance I had. I was saddened to hear the news of Joanne’s passing but just sitting here remembering her escapees all I can do is smile. Her memory lives on.